I'm trying to re-link my new Zotero installation to my old web dav location at box.com. As the below screenshot shows, I'm trying to sync to the URL https://dav.box.com/dav/zotero which is suggested on the Zotero website. 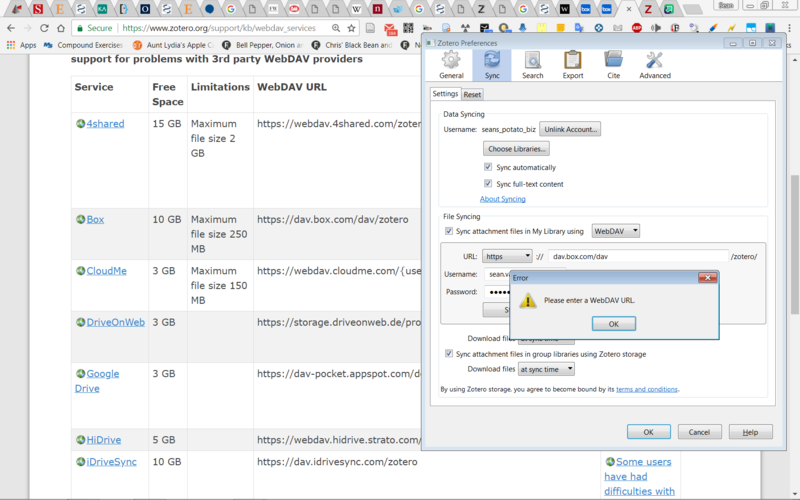 When I click 'verify server', I get the error message 'please enter a valid WebDAV URL". Why is this URL not considered valid for me? Could we see a Debug ID for a Verify Server attempt? I have made a request to my IS department to update my Zotero for Windows installation. It is likely to take at least a couple of days before this is done. Unfortunately, Zotero was updated just a day or two after my last request was serviced.